The Sedgwicks: A History of 'Madness' Author John Sedgwick profiles his creative and sometimes crazy clan from its roots in the American Revolution. 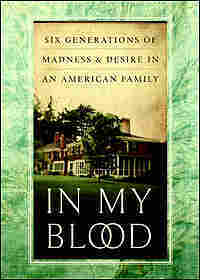 His book, In My Blood, is subtitled "Six Generations of Madness and Desire in an American Family." Author John Sedgwick profiles his creative and sometimes crazy clan from its roots in the American Revolution. His book, In My Blood, is subtitled "Six Generations of Madness and Desire in an American Family." “In My Blood” is the name of a compelling family biography. The story of “Six Generations of Madness and Desire in an American Family” - that's the subtitle. The Sedgwick family has been part of this country since the beginning - in fact, since the 17th century, fully 100 years before the birth of the nation. But the first Sedgwicks to make their mark on the country met and married right around the time of the founding of the United States, and set in motion a family that has fairly spectacularly succeeded and failed ever since -propelled, as the subtitle says, by madness and desire. Theodore Sedgwick - the family calls him The Judge - was the founder of the modern family. He was a friend of George Washington. In our times, Sedgwicks include the actress Kyra Sedgwick and the writer John Sedgwick, now part of the older generation of his family who's written this extraordinary book about them. He joins us from member station WBUR in Boston. Mr. JOHN SEDGWICK (Author, “In My Blood: Six Generations of Madness and Desire in an American Family”): Thank you. WERTHEIMER: You begin the book in the most amazing way, telling the story of the day you almost, but not quite, killed yourself. Mr. SEDGWICK: Yes, I was quite anxious about a variety of things, some of them financial, some of them strictly emotional, having to do with my mother, whom I just put in the psychiatric hospital for her sixth hospitalization. This particular night, I was unable to sleep. And in the morning, I got up and went nuts. WERTHEIMER: You talk about - let's see, you talk about it on page eight. You were in the middle paragraph there, say, where you talk about what brought me to the window. I wonder if you could just read that paragraph for us? Mr. SEDGWICK: (Reading) “I unlocked it, drew my hand back, and stared down at the ground below - the grass that was starting to fade as winter came on, the rock garden where a few hardy chrysanthemums still bloomed. In his memoir of depression, William Styron tells of a moment when hearing a bit of Brahms ‘Alto Rhapsody,' with its many childhood associations, saved him from doing himself in. I didn't hear any music. The room was silent except for my breathing. Still, I did not raise the sash, draw up the screen, hurl myself out. WERTHEIMER: When you recovered from this major but not severe depression, this first bout with it, you began to think that this was coming from somewhere in your family - somewhere way back. Mr. SEDGWICK: That's right. I had the sense that this did not begin with me, just as my life did not begin with me. WERTHEIMER: Now, you started with The Judge. Mr. SEDGWICK: Right. Theodore Sedgwick. WERTHEIMER: What I was interested in was that The Judge served in the Continental Congress. Mr. SEDGWICK: That's right, in the Continental Congress in New York. And then he served in the first Congress under the new Constitution with Washington as its president, and then later in Philadelphia, and finally in Washington, where he was speaker of the House in 1800. I would say that he was the one to lift the family up - not only his own children, but generations of Sedgwicks to come. WERTHEIMER: Now, the problem with all of that industry and all of that accomplishment was that he had a very sad, depressed wife who was at home having babies all by herself. Mr. SEDGWICK: She, of course, had help. There are a number of servants. But the responsibility fell heavily on her. And she often would, you know, send these letters to Theodore, begging him to return. And he would reply by saying, well, not now. There were two competing interests. There were her brood of seven, and his brood of the entire country, and that he felt it was essential for him to remain at his post, no matter how much she might need him. WERTHEIMER: And, basically, the theme of the book was that his amazing industry and her very sad depression combined to create multiple generations of Sedgwicks who were both things. Mr. SEDGWICK: It certainly set up a dynamic in the family that produced a lot of creative, industrious, and successful people. What it also did, of course, was to create this emotional range that was perhaps too extreme in some cases. WERTHEIMER: Somewhere around the beginning of the 19th century, the Sedgwick Pie came into being. I wonder if you could just tell us what that is and why it's important. Mr. SEDGWICK: The Sedgwick Pie is located in the back of the Stockbridge Cemetery. It's a private graveyard that takes a very unusual shape. It's a series of concentric circles of grave stones, all ringing a common pair of ancestors - Judge Theodore Sedgwick and his wife Pamela, who was the mother of all of his children. Those children, seven of them, are buried in a circle at their parents' feet. And their children are buried behind them, and so on out it goes six generations to the place where I, ultimately, will go behind my father and mother on the eastern slice of this pie. All the other graveyards, at least in Stockbridge, are oriented to the east, to the place of resurrection. But here, the graveyard is oriented towards these presiding parents as if they are the Gods here. WERTHEIMER: So when the Sedgwick's rise up what they see - that's the joke, the old joke isn't it? Is other Sedgwicks? Mr. SEDGWICK: That is the old joke. It's one that the Sedgwick's have been trying to live down for at least the two generations, yes. WERTHEIMER: Now the, about half the book is devoted to the first family and then you spread out. It really is very compelling, I think in part because these people are so attractive and accomplished, and sometimes so tragic and sometimes so crazy. They're like characters in a very good novel. And you write with great confidence about their feelings, about what they thought, about conversations they had with each other. How were you able to do that? Mr. SEDGWICK: Well, the holdings at the Massachusetts Historical Society are immense, and I did my best to go through them. I should say that the papers there are second in size only to the Adam's papers of the two presidents and the Adam's family. It was a bit of a trick to go into it selectively and pull out just what I wanted and not to get completely bogged down. WERTHEIMER: You write that these Sedgwicks were like you are, writers. That they wrote everything down. WERTHEIMER: He's in the first generation of children. Mr. SEDGWICK: Thank you, in the first generation of children, who, when he witnessed a fire down in New York City. Anyway, it's that kind of really vivid, intense, closely-observed writings that actually characterizes most of the family members and made them come alive for me. WERTHEIMER: John Sedgwick's book is called, “In My Blood: Six Generations of Madness and Desire in an American Family.” Thank you very much for talking to us. Mr. SEDGWICK: Thank you Linda, it's been a pleasure.